In Christopher McDougall's Born to Run, apart from the story of the Tarahumara, he also mentioned one of the food that they ate, a drink the Tarahumara called iskiate and which supposedly gave them the energy to run all day. The main ingredient that went into iskiate is Chia seeds. I have been eating Chia seeds for the past 2 months or so. Did it gave me the additional energy that I need? The verdict is still out since I am not doing a great deal of running. But I am eating them regularly if not for the energy but for the many health benefits that purportedly comes from it. But just how exactly does one eat Chia seeds? 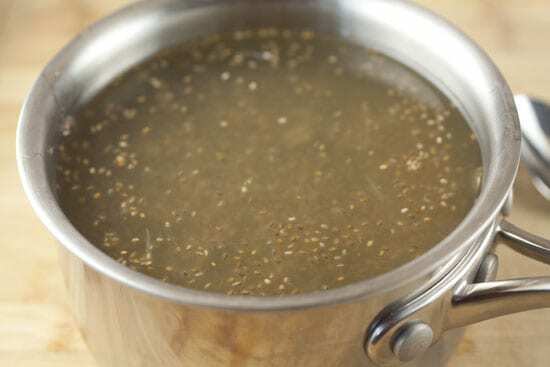 In the book, chia seeds is added to water and lime juice and stirred until the Chia seeds expands and dissolve into a soft gel. Nectar is added to taste. This is a picture lifted from this website. Doesn't look very appetizing does it? Me? I am the lazy sort and I can't be bothered to go through all the trouble. These are some lazy man way to eat Chia seeds. 1. Put 2 teaspoons into your drink. Fruit juice or milo. No need to add anything else. Great as a pre-run drink. In fact, they are so versatile that one can add to almost anything or just eat it on its own. Finally, where to get them in Singapore? I got my first bottle from a shop in Parkway Parade at $15.00 for a 250gm bottle. They are also available in satchet from the major supermarket, marketed as Chia Shots but I think this one is quite ex. Finally, they can be purchased from this blogshop at $19.50 for a 400 gm pack. Just saw your blog. Where exactly can you buy Chia seeds? Guardian? A pharmacy? Hi Radhika, So far I haven't seen them at Guardian or any pharmacy. You can try the 3 places I listed above or at any organic shops. 1. This discount coupon is only applicable to items in the Superfoods category, excluding Bundle Deals. 2. This discount coupon is valid till 30 Nov 2012. 3. Courier shipping charge of $6.00 applicable for net orders below S$50. Payment can be made by interbank transfer or Paypal/credit card. Please contact Chewy Loh at bgosingapore[at]gmail[dot]com if you have further queries.